Can be edited for younger or older learners. Use as a study guide, on-going guide for research, or assessment. Vocabulary- Write the definition for the following words. 1) Describe the process of photosynthesis. 2) Describe the process of cellular respiration. 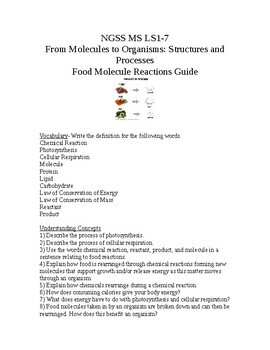 3) Use the words chemical reaction, reactant, product, and molecule in a sentence relating to food reactions. 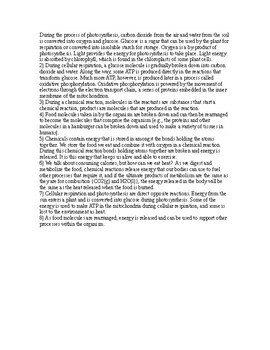 4) Explain how food is rearranged through chemical reactions forming new molecules that support growth and/or release energy as this matter moves through an organism. 5) Explain how chemicals rearrange during a chemical reaction. 6) How does consuming calories give your body energy? 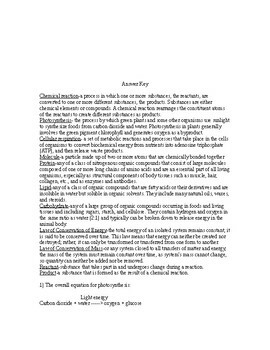 7) What does energy have to do with photosynthesis and cellular respiration? 8) Food molecules taken in by an organism are broken down and can then be rearranged. How does this benefit an organism? heck out my NGSS MS-LS1-7 PowerPoint to use as a resource.